The Solaris Editors' Blog: More monkey business: 'HIVE MONKEY' is the sequel to the smash hit 'Ack-Ack Macaque'! More monkey business: 'HIVE MONKEY' is the sequel to the smash hit 'Ack-Ack Macaque'! Gareth L. Powell's primate pilot is back for more monkey business in Hive Monkey – the sequel to the hit gung-ho Steampunk smash hit Ack-Ack Macaque. With a barrel-full of trouble and a chamber-full of attitude, charismatic but dangerous former Spitfire pilot Ack-Ack has gone into hiding working as a pilot on a world-circling nuclear-powered Zeppelin. But when the cabin of one of his passengers is invaded by the passenger's own dying doppelganger, our hirsute hero finds himself thrust into another race to save the world this time from an aggressive hive mind, time-hopping saboteurs, and an army of homicidal Neanderthal assassins! 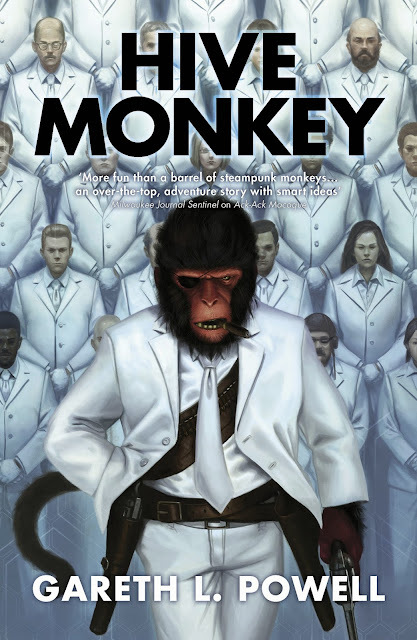 After an appearance in legendary British comic book 2000 AD last year, Ack-Ack Macaque was the surprise new direction for the renowned SF author, combining Powell's incredible inventiveness with a fresh take on the Steampunk genre and an invigorating splash of Boy's Own comic book-style adventure. Already with a firm online fandom and more than 6,000 Twitter followers, Ack-Ack Macaque's latest 'tail' is bound to excite and thrill! Gareth L. Powell is the author of Silversands and The Recollection, as well as the critically acclaimed short story collection, The Last Reef. His work has been published all over the world and featured in a number of recent anthologies. Hive Monkey is his second Ack-Ack Macaque novel for Solaris. A regular contributor to anthologies and magazines, Gareth penned a strip for Britain’s long-running sci-fi and fantasy comic, 2000AD, and has written articles for The Irish Times, SFX, Focus, and Futurismic.